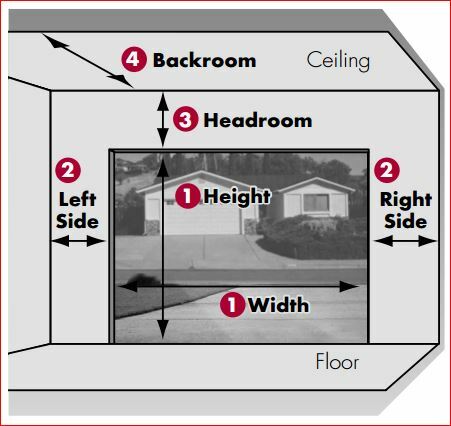 Step 4 Measure area labeled �backroom� � distance is measured from the garage door opening toward the back wall of the garage. Backroom: _______________ Common garage door sizes include 8' wide x 7' high, 9' wide x 7' high and 16' wide x 7' high. Holmes manufactures most doors in nearly any size you require. The elements of all sectional garage doors are essentially the same. Framework, panels or skin, track, springs, hardware and accessories are easily identified once you know where and what to look for. This glossary of door industry terms defines the most common elements of a garage door. A fancy name for the bottom weatherstrip. Wood doors usually require a molded vinyl astragal nailed to the bottom of the bottom rail. All steel doors come with a vinyl astragal which slides down a rust-free aluminum channel mounted to the bottom of the door. When the door is closed, the astragal helps create a seal against the garage floor. The backroom is the distance from the garage door opening toward the back wall of the garage. The door height plus 18" is required for proper door installation. See How to Measure Your Door Illustration, page G4. Additional backroom is required for installation of an automatic garage door opener. Bottom brackets are affixed to the bottom corners of a garage door. They serve two functions: 1) each holds a roller and 2) provides the point of lift for the cable. All Holmes standard height residential steel doors use Safe-T-Brackets�. Under normal conditions these bottom brackets cannot be removed while the door is under tension. Top brackets are located near the top corner of each door. These brackets also serve two functions: 1) each holds a roller and 2) are adjustable to provide a tight fit against the jamb when the door is in the closed position. 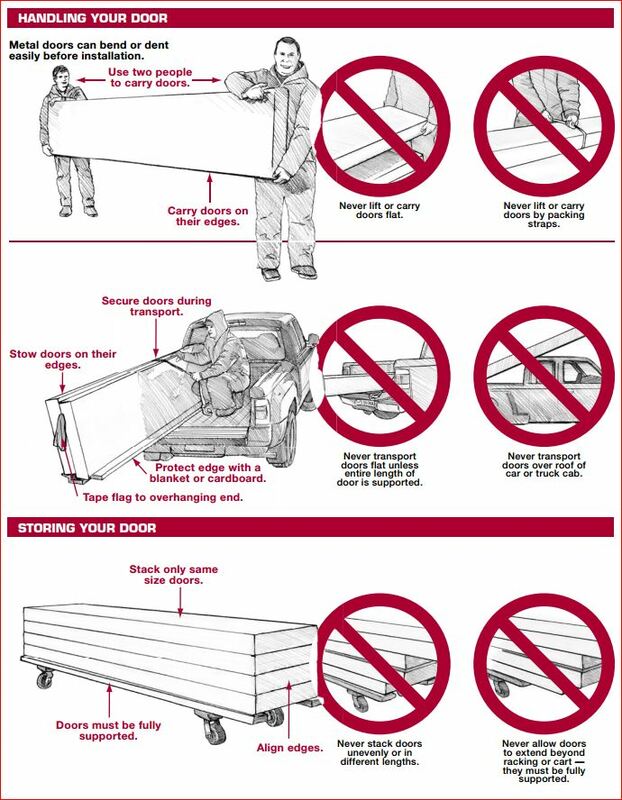 Garage doors are said to be bowed when the door sections are not level or straight. Picture a closed door that appears to be �smiling,� i.e. the corners (ends) are turned up. On wood doors, bowing is often caused by deteriorating rails, usually due to moisture. On steel doors, excessive bowing occurs when the door is not properly reinforced. These multistrand wire cables are used to attach the door (Bottom Brackets) to the springs. On extension springs the cable rides over pulleys, while on torsion springs the cable is wound on drums. This feature adds to the look of a solid wood door, providing the illusion of separation between either side of a carriage house door. In other words it appears that a solid door is two separate swing open doors. Available on Lodgewood� Collection doors. A flat piece of composite material added to a flush door to provide the look of a classic carriage house wood door. Found on Settlers� Collection doors. These can be added to plain Holmes windows. Commonly used to refer to larger width doors usually on multicar garages. Holmes specifically defines them as widths over ten feet. This means that the steel surface has been raised in relief from the surface. This can provide a raised panel look or a woodgrain texture. Commonly called stretch springs, their function is to counterbalance the weight of the garage door. Extension springs are mounted to the rear track hangers on each side of the garage. They are attached, at the other end of the spring, to a pulley. As the door travels, the springs stretch, or compress, to balance the door weight. Holmes offers standard extension springs and EZ-SET� Extension Springs. The EZ-SET� Springs are easier, faster and safer to install. The spring tension is set and adjusted in seconds using a 3 ⁄8" drill, and the system eliminates the need to manually lift the dead weight of unsprung doors. 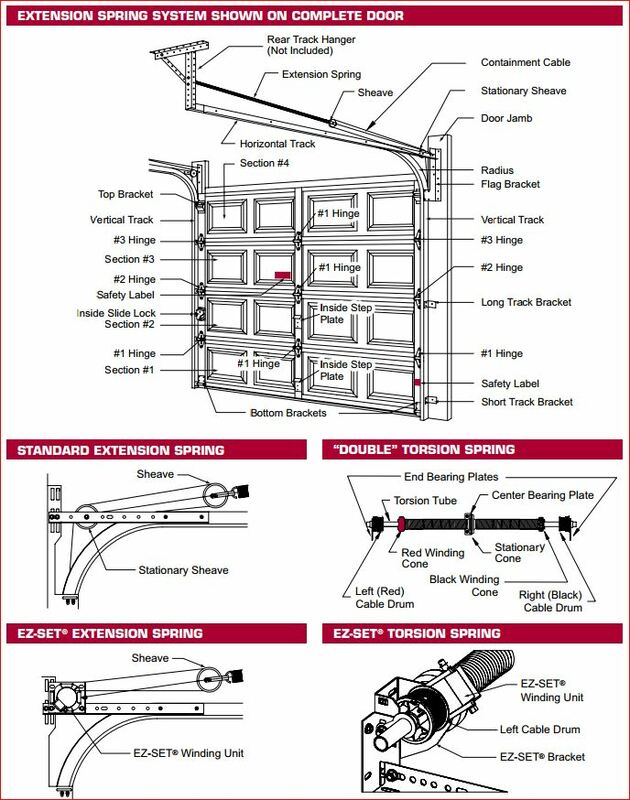 EZ-SET� Springs are recommended for Do-It-Yourselfers or others without garage door installation experience. Piece of steel hardware that attaches the vertical track to the horizontal track and supports the horizontal angle at the jamb. This describes a door with no raised or recessed panels. In reference to steel, galvanized means the amount of zinc contained in the steel alloy. The quantity of zinc directly impacts the rust inhibiting capabilities of the steel. Holmes doors use a hot-dipped galvanized steel to provide the most rust resistant steel door available. This term refers to the thickness of the steel used in garage doors. The smaller the gauge number, the thicker the steel. Prevalent steel gauges used in Holmes garage doors are 25 and 27. A glazed section would be one with windows or lites. Glazing/lites are available in non-insulated single strength, obscure, and acrylic and insulated double strength and obscure glass. Designer Classic windows or Designer Etchings� add beauty to any home. These are added to windows to provide the look of separated lites. The measurement from the top of the door opening upward to the lowest obstruction on the inside of the garage. Use this measurement for clearance all the way back to the end of the horizontal track. Holmes headroom requirements are listed below: (See Radius) Additional headroom is required for attachment of an automatic opener. Typically 3" is required for installation of an automatic garage door opener, but check with manufacturer�s specific requirements. Track Extension Torsion Radius Spring Spring 12" 10" 12" 15" 12" 14" Special hardware is available for low headroom that can reduce the headroom requirements to as low as 41 ⁄2". There are two ways to achieve lower headroom: 1) Double Track Low Headroom Conversion Kit Hardware to modify the standard track assembly that will reduce the minimum headroom requirement on standard extension or EZ-SET� Extension Springs to 41 ⁄2" and on EZ-SET� Torsion Springs to 91 ⁄2". 2) Quick Turn Brackets (Extension Only) Hinged arm bracket used to replace standard top roller brackets which will reduce the headroom requirement to 8" on 12" radius track doors. Not to be used in conjunction with other low headroom options. To make the independent sections act as a complete door, the sections must be hinged together. Hinges are found on the end stiles and center stiles at the meeting rails. All hinges perform two basic functions: 1) With bolts or screws, they join the sections together and 2) they allow the sections to �break,� independent of each other, as the door travels. Hinges on the end stiles perform two additional tasks: 1) They are designed to hold a roller, upon which the door travels and 2) they are offset to provide a flush fit to the door itself when in the closed position. In an effort to reduce energy costs, improve comfort and provide quieter operation, many customers will look to insulated garage doors. Holmes residential doors use polystyrene insulation which is environmentally friendly (contains no CFC�s) and does not lose R-value over time. Simply stated, this is the upright framing on each side of the door opening. The vertical track is mounted to the inside surface of the jamb and the stop molding is nailed to the side surface within the opening. 2" x 6" jambs are recommended. This is the grip handle provided on the inside and the outside of the door to help manually open and close the door. There are several types of locking mechanisms used on garage doors, but all serve the obvious function of securing the door in the closed position. Whether the form is a lock handle, T-handle, slide-bolt, or 5-pin cylinder, the function is the same. The main difference is how the door is secured to the track. With Lock Bars, the handle turns a cam-type plate, which is attached to long metal bars, each bar running to one side of the door. When locked the bars extend through the vertical track and the door is firmly secured. With a Snap Latch, the cam plate pulls a cable, which is attached to a spring-loaded latch. When locked, the latch fits securely in a notched piece attached to the vertical track. If attaching an automatic opener, the spring latches and striker plates should not be installed. The Slide Bolt lock attaches to the inside of the door and engages into the track. This lock does not have an outside keyed mechanism or outside handle. It is used primarily when an opener is installed and not being used. A steel bracket that must be used when installing an automatic garage door opener. Provides proper reinforcement to the top sections and prevents damage to the garage door. The framework members on wood doors encompass a true panel. Many steel doors have a �panel look� stamped or embossed into the skin. This gives the visual impression of a raised panel. Holmes Steel Doors are manufactured using factory prepainted steel. The galvanized steel is painted with a baked-on epoxy primer then given a tough baked-on polyester top coat to help prevent rust and ensure long term durability. All Holmes residential doors are available in white, brown, sandtone and almond colors. These doors do not require a finish coat, but may be painted with a high quality exterior latex paint to match the house trim. Holmes Wood Doors have the option of being painted with a prime coat at the factory. This coat is sprayed on all sides of the sections and oven baked dry. Prime painting must never be considered as the finished coat. The horizontal members of the door�s framework are called rails. There is a top rail, a bottom rail and several meeting rails. This term is typically used with wood doors. A raised panel differs from a flush panel because it provides a third dimension to the door�s appearance. The panel is raised in relief from the surrounding panel surface and is available in standard and long designs. Often constructed of punched angle iron, these hangers attach the end of the horizontal track to the garage ceiling. Think of these as little wheels on long axles. The axles fit into the hinges or brackets and the wheels roll in the track during the door�s travel. Holmes uses high quality nylon rollers. Thermal transmission measurement of heat transfer. The higher the R-value the better the resistance to heat transfer. Inverse of U-value. An extra cable used with extension springs to prevent pieces of the spring from causing damage or injury in the event the spring breaks. The cable is threaded through the center of the spring and is secured on both ends of the horizontal tracks. All Holmes doors equipped with extension springs include the safety spring containment cable. �Sectional door� defines a door having independent sections of framework, panels or skin. Each section is stacked, one on top of another, to create a sectional garage door. Residential steel door sections are either 18" or 21" in height to make up various door heights. This defines a step pattern configuration of the meeting rails or sections. When closed, the shiplap helps prevents rain, wind and light from infiltrating the door between the sections. A measurement from each side of the door opening, outward to the nearest obstruction within the garage. Allow on each side of the door 33 ⁄4" for standard extension and torsion springs and 51 ⁄2" for EZ-SET� Extension Springs to allow for installation of the track. Commonly refers to door width frequently seen on one-car garages. Holmes specifically defines them as widths up to and including 10 feet. 8' and 9' wide doors are common single car widths. The door�s vertical framework pieces are referred to as stiles. There are end stiles, oftentimes a center stile, and several intermediate stiles. It is important to note that almost all sectional doors are framed in this manner, whether the framework is wood or steel. The amount and dimension of the framework determine the basic structural integrity of the section. Sometimes called door stop or perimeter weatherseal, it is usually vinyl with a flexible strip and it serves to seal the perimeter of the door against weather and light infiltration. Stop molding is nailed to the jamb, outside the door, and is one of the final steps in the installation process. Also called trusses, these �U� shaped metal reinforcement members are attached to the inside of the door to add strength and rigidity. Struts are necessary on wide and heavy doors to prevent sagging, bowing and to support operator attachment and on doors to meet high WindCode� standards. Method of mechanically securing two pieces of steel together without welding, riveting or bolting the section together. Eliminates rust where the steel is secured. A joint with an interior raised portion, fitting with an interior lowered portion to create a weather-tight seal between door sections. When the door is closed, the tongue-and-groove joint helps seal out wind, rain and light. This spring system performs the same counterbalancing function as extension springs. Holmes offers both standard torsion springs, which are manually wound, and the patented EZ-SET� Torsion Springs, which is wound using a 3 ⁄8" drill. Both types of springs are mounted above the door opening, wound, or charged, then set to a shaft, which runs through the spring. The spring actually turns the shaft to raise or lower the door via the cables winding on drums. Holmes recommends that standard/manually wound torsion springs be installed, repaired or removed only by experienced, professional door installers. Garage door track usually consists of 4 pieces (2 vertical and 2 horizontal). The purpose of track is to provide a roadway for the roller wheels. The vertical track is mounted to the jamb with brackets, on each side of the door opening. The horizontal track is mounted to the top of the vertical track, the door jamb and the garage ceiling. The horizontal track contains a curved end called the Radius. (See Radius) In the closed position, the door is resting in the vertical track. In the open position, the door is suspended from the horizontal track. Holmes offers garage doors designed to meet specific wind speeds. These doors have added steel reinforcement struts, upgraded springing and heavy-duty commercial grade track and rollers to meet wind speeds and gusts ranging from 75 MPH to 170 MPH.